Advertising for a Mission Impossible movie screening on TV2 in New Zealand took on its own mission impossible twist this week with a campaign involving a rival TV network and wild animals. In the early hours of yesterday morning, a giant billposter advertising Mission Impossible 111 was plastered over the front windows of TV3 headquarters in Auckland. The billposter, reading: “Mission Objective: advertise this movie in enemy territory”, was one of several pieces of creative developed by Saatchi & Saatchi to advertise the movie. A second giant billposter was set up in the lion enclosure at Auckland Zoo yesterday afternoon. 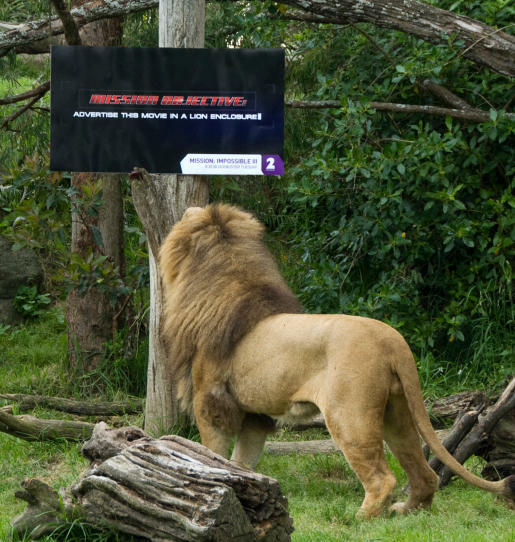 This one, reading: “Mission Objective: advertise this movie in a lion enclosure”, was installed with the help of zoo officials. This installation was more short-lived, with the poster quickly torn apart by one of the lions. 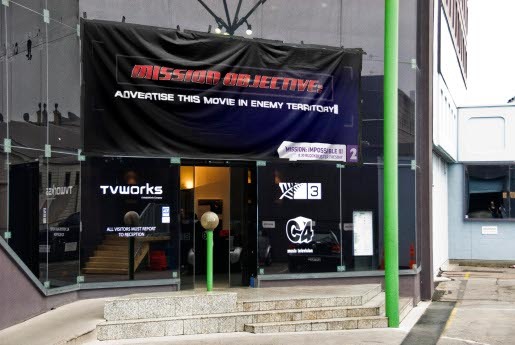 An online stealth mission was also conducted on the TV3 website. A specially designed Sanyo banner, containing a built in ‘time-bomb’, was set up so the picture would morph into the TV2 Mission Impossible III advertising. A series of billposters around the city, with a mission objective of being stuck up with chewing gum, completed the creative. The Mission Impossible campaign was developed at Saatchi & Saatchi NZ by executive creative director Mike O’Sullivan, creative director Luke Chess, creative Mike Felix and photographer Mattias Somers. The latest advertising was part of an ongoing campaign for TV2 movies. This has included a number of billboards for an American Psycho screening earlier this year, including an American flag with a bloody handprint, a billboard featuring George W Bush, and a billboard drawing attention to a hotel with blood-stained windows. A suitably gruesome billboard was also created for a Kill Bill screening in May, with a shot of Uma Thurman wielding a sword given an extra dimension with a large ‘blood’ splatter from the billboard down the wall and onto the footpath and several parked cars.